Image guided spine procedures with different names like Selective Neuroplasty, Transforaminal epidural, Interlaminar epidural , Selective Neuroplasty, Selective root sleeve block used for pain syndromes due to common conditions such as degenerative disc disease. The method involves injecting a medicine into the epidural space of the spinal canal, where the irritated nerve roots are located. The medicine then spreads to other levels and portions of the spine, reducing inflammation and irritation. The procedure can be used for diagnostic as well as therapeutic procedure. If the injection takes away your pain immediately, this gives your doctor important information suggesting that the injected area is indeed the source of your pain. • A cervical epidural is an injection of anti-inflammatory pain medications like cortisone into the cervical region of the spine. • This injection is not given in bone or spinal cord. • A patient may need an epidural for one of many reasons. The procedure can be performed as a diagnostic tool in uncovering the exact site and nature of neck pain, or it can be used to treat chronic pain, inflammation, and stiffness in the neck and shoulders. • Cervical epidural is typically reserved for cases where significant nerve damage around the spine is responsible for pain. • Before the procedure, a patient is given a shot of local anesthetic to numb the area. Procedure is done under fluoroscopic (Special X-Ray) guidance and local Anesthesia. After confirmation of nerve roots involved, by injecting contrast as seen in this video, solution is injected. • Procedure is done in OT and takes 25-30 minutes. After procedure patient is shifted to recover room for observation. Patients are usually discharged after 2 hours. 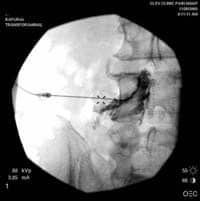 Lumbar selective root sleeve epidural procedure is performed similar to cervical epidural, only difference is here each nerve can be accessed with precision . Pain medicine is deposited near pinched nerve to reduce the inflammation. While the effects of the injection provide relief from pain for one week up to one year – an epidural can be very beneficial for a patient during an acute episode of back and/or leg pain. Importantly, an injection can provide sufficient pain relief to allow a patient to progress with a rehabilitative stretching and exercise program. If the initial injection is effective for a patient, he or she may have up to three in a one-year period. Consult Spinomax Pain & spine to find out if you are right candidate for Epidural spine treatment.